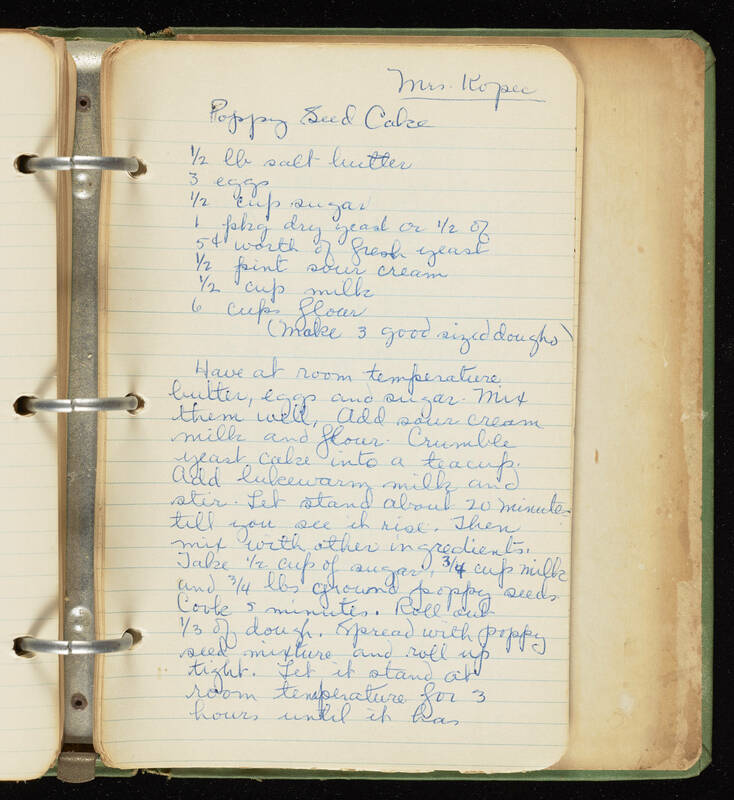 Danny Poole Mrs. Kopec Poppy seed cake 1/2 lbs salt butter 3 eggs 1/2 cup sugar 1 (folng) dry yeast or 1/2 of 5 cents worth of fresh yeast 1/2 pint sour cream 1/2 cup milk 6 cups flour (make 3 good (siged) dough's) Have at room temperature butter, eggs, and sugar. Mix them well, add sour cream, milk, and flour. Crumble yeast cake into a teacup. add lukewarm milk and stir. Let stand about 20 minutes you see it rise. Then mix with other ingredients. Take 1/2 cup of sugar, 3/4 cup milk and 3/4 lbs ground poppy seeds. Cook 5 minutes. Roll out 1/3 of dough. spread with poppy seed mixture and roll up tight. Let it stand at room temperature for 3 hours until it (has).